The Law Office of Frank Gormlie has announced that a press conference will be held Tuesday morning, December 3rd, where Vince Adame will announce that the felony charges against him for trimming city-owned hedges have been dismissed. Vince Adame had been charged with felony vandalism, a violation of Penal Code 594, accused of maliciously destroying five bushes of New Zealand Christmas Tree on a slice of city-owned land behind 5072 Niagara Avenue in OB – right above the OB Pier parking lot. 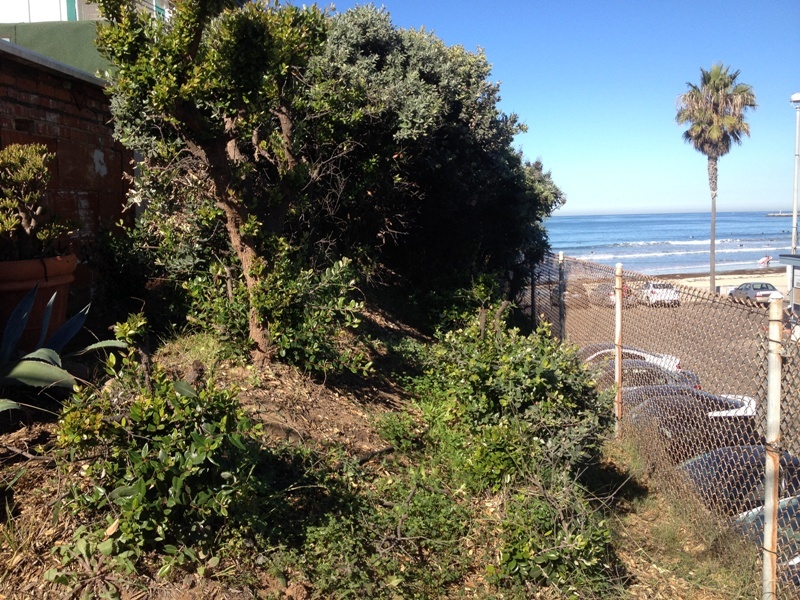 Vince Adame, a local property owner who lives near the Pier, openly admitted that he had trimmed the hedges – as well as admitting that he also cleaned up cardboard, bottles and other trash left by people living or hanging out in the bushes. The Press Conference will be held at 9 a.m., in the alley and behind the property at 5072 Niagara Avenue. The law office representing Mr. Adame is asking that OBceans or anyone who supports Vince to come on out and show that support by attending the Press Conference. Frank Gormlie also is the editor and publisher of the OB Rag. Obviously we will need you in many hats, Frank. Good job. Update, the DA is female ( not to be confused with the other atrocious “City Attorney” Jan Goldsmith/male persuasion, who also needs replacing) and her name is Bonnie Dumanis and she is up for re-election and there is a credible opponent named Robert Brewer this time around and I urge all readers to vote for the alternative and not the incumbent! yay! one for the good guys. Hmmm,……..lets think about this , two SDPD detectives, two SDPD sergeants, city attorney, asst city attorney, da, asst. da, prosecutor, director of park & rec., numerous people at multiple garden nurseries on multiple visits, Kevin Faulconer’s office, just a few of the people and offices involved in this case. Are we ( the taxpayers ) supposed to believe that NOT ONE person had the simple thought that maybe those bushes would grow back ? two seasoned detectives Moody & Anderson can handle homicides, assaults, rapes but they are not wise enough to know bushes or tress grow back ? If you think this case is about bushes I have a bridge for sale. If it wasn’t for the OBrag and support from locals getting the word out this case would have continued to trial. GREAT JOB FRANK ! The neighbor thought the property was his, or at least that is what he told the police.